The Eppendorf 5415R Refrigerated Microcentrifuge is user friendly just like the rest of the Eppendorf centrifuges that have become a staple in labs everywhere. The benefits include the almost indestructible maintenance-free drive, which requires only 13 seconds to accelerate to the maximum speed of 13,200 rpm (max. rcf: 16,000 x g). The fixed angle rotor equipped with the Eppendorf 5415R runs so smooth that particles have already been pelleted are not unintentionally re-suspended. The Eppendorf 5415 R refrigerated micro-centrifuge enables rapid and reliable refrigerated centrifugation in a temperature range between 0 °C and 40 °C. The 5415R’s temperature-sensitive samples are maintained safely at 4 °C, even at maximum speed. In the stand-by mode, the centrifuge then can be set to the desired temperature. With the aid of the Fast Cool function, refreshing 4 °C can be attained within a mere 16 minutes. One undisputed innovation on the Eppendorf 5415R centrifuge is the new motorized lid latch. Two built-in gripper arms close the newly designed lid automatically. 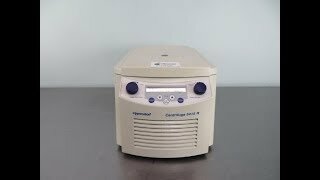 This Eppendorf 5415R Centrifuge is in excellent condition. The 5415R Refrigerated Centrifuge has been tested to meet the factory specification and is currently ready to be shipped. Please note the rotor that comes with this centrifuge does not come with a lid. Should you have any questions about any of our refrigerated centrifuges, please don't hesitate to contact us.